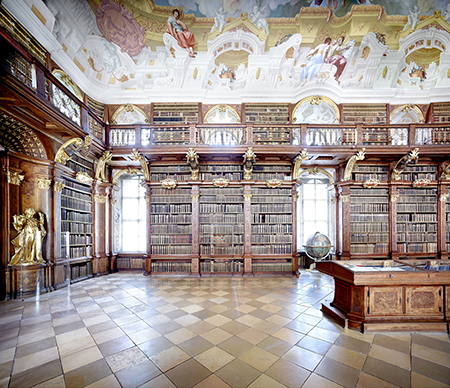 Candida Höfer, "Benediktinerstift Melk III," 2014, C-print, 70 3/4 x 82 3/4"
Candida Höfer’s current exhibition, titled "Spaces and Places," shows the conceptual photographer — who was a student, like Andreas Gursky and Thomas Ruff, of Bernd and Hilla Becher — continuing her examination of empty architectural spaces. Among the fourteen color photographs on display are five large-format works, formally composed, often frontally or even symmetrically, that deliver beauty and power, with only a hint of social critique. Höfer’s depictions of these grand institutional spaces — libraries, palaces, and symphony halls — exult in glory and grandiosity, but also implicitly question their functionality or permanence. These a0re habitats without inhabitants, like museum reconstructions of Renaissance palazzi. Smaller works strike a more personal tone. "Li Yuan Library," in a small village outside Beijing, seems to be constructed of books, although it is made of small pieces of wood, found locally, that is traditionally used for firewood by villagers. The sticks’ resemblance to books, all too evident in Höfer’s trio of photos, suggests that the architects, Li Xiaodong Atelier, may have found common ground between postmodernist vernacularism and the moralizing or symbolic architecture (never built) of the 18-century French visionary, Jean-Jacques Lequeu. Other small works include detail shots of modern buildings: windows seen through a scrim of curtain; teacups on a lap tray parked on a bentwood chair; and the ends of two small pieces of paper affixed to a window, contrasted with background blur: Hans Hofmann push-pull rendered with photo bokeh.